Hello my lovelies and welcome to my new post! I hope you are having a beautiful August day and that you are enjoying the sunny weather. Soon as summer is still here, I wanted to dedicate today's post to one of my favorite fashion garments when it comes to summer wardrobe - women dresses! It is just the most convenient and fun thing to wear on hot days like this, so I believe it's important for every girl to have at least a few summer dresses they can choose from. The dresses I will be showing you today come from a store called DressSure and they have a large variety of garments including plus size dresses. I enjoyed browsing their site while searching for something that I can wear for the rest of the summer but during the autumn as well. 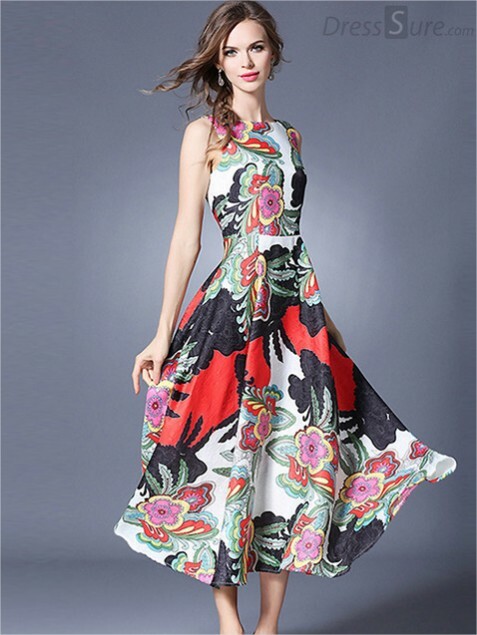 The great thing about this store is that you can shop via different criteria - you can pick out the length of the dress, the style and the silhouette that you find most appealing and just see right away all the dresses you are interested in. I picked out a few of my favorite design dresses for you and I hope you will enjoy my choice. I personally find all of them to be universally flattering and suitable for many occasions. Prints are super popular this season, waist cut helps to get your figure to look slimmer and they go well with any type of shoes and bags. What do you think about my picks my lovelies? Please share your favorites and your thoughts about these dresses!